Whether in tragic or comic ways, error imitates truth, and real Theosophy has always been surrounded by a host of often brilliant or spectacular forms of pseudo-theosophy. One significant example of this occult law can be found in the creation of a theosophical cult around the personality of Jiddu Krishnamurti (1895-1986). Even now the Krishnamurtian creed subsists, although in a rather quiet way, and Mrs. Radha Burnier - the president of the Adyar Theosophical Society since 1980 - is one of its staunchest leaders. Krishnamurti was 14 years old when he was “discovered” in Adyar by C.W. Leadbeater. By then, both Annie Besant and Leadbeater used to have long imaginary conversations with some “Lord Christ”. Soon after the discovery, the boy was officially presented to the world as being a high initiate and future avatar - the vehicle for the second coming of the Lord himself. In this as in other occasions, HPB’s words had been most clear. But the Adyar leaders were so busy following their own fancies that they did not have time to take Theosophy into consideration. A “Liberal Catholic Church” was then organized to serve as a “vehicle” for Krishnamurti, the Christ. The Order of the Star was to be the main messianic organization. The Adyar Theosophical Society and its Esoteric School were transformed in auxiliary instruments for the Adventist experiment. The new Master’s catechism was to be the little book “At the Feet of the Master”, cleverly written by Leadbeater and presented as being the result of instructions of an Adept-Teacher to Krishnamurti, who then supposedly had taken notes. 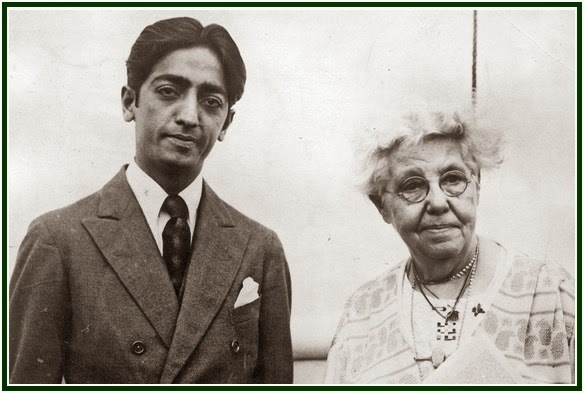 Mary Lutyens, Jiddu Krishnamurti’s close friend and his main biographer, reports in Chapter One of her book “The Life and Death of Krishnamurti” that the would-be notes written by him “disappeared”. The only originals anyone ever saw of that devotional booklet were the ones typewritten by C.W. Leadbeater. Once Krishnamurti reached adulthood, he denied being the author of “At the Feet of the Master”. The booklet was never included among Krishnamurti’s works. Krishnamurti Foundations do not sell it. Yet its “authorship” is still nominally ascribed by the Adyar publishers to “Alcyone”, which is the pseudonym created by Leadbeater for Krishnamurti in his phantasy-book “The Lives of Alcyone”. Deeply surprised, Subrahmanyam related the dialogue to his close friend Wood. “Bad news run fast”, according to a popular saying. As soon as Mrs. Annie Besant was informed of the fact, she called Subrahmanyam to her presidential office. Mrs. Besant told him that it was simply “not possible” that Krishnamurti had ever said such a thing. She then presented Subrahmanyam with the alternative of “immediate recantation - or banishment from Adyar”. Since its appearance in 1910, the best-selling booklet “At the Feet of the Master” was a great event. Its success gave strength to the creation of the messianic organization “Order of the Star in the East”. From the viewpoint of Mrs. Besant, the creation of a new Messiah could never be disturbed by such uncomfortable facts like that dialogue witnessed by Subrahmanyam. The mere idea that a young boy had written a “grown-up text” was used and presented as a “phenomenon” in itself. It was something “quite extraordinary”. It seemed to be a hard evidence that Christ/Maitreya had indeed decided to come back. All that people had to do was to believe in the pyrotechnic display of imaginary wonders. Here Leadbeater spoke as if he were a great sage. Self-importance fancies were so strong in Adyar that some years later, in 1925, Annie Besant would announce a most remarkable fact: she herself, as well as C.W. Leadbeater, J. Krishnamurti, George Arundale and others, had all achieved Adepthood and were now “Masters and Initiates of the fifth circle”. For some reason, though, soon after that announcement it became obvious that Besant had lost both her mind and her balance, as duly reported by Mary Lutyens and Ernest Wood. The Master thus explains that Adepts can hardly get near persons who believe in superstitions like “God or Gods”. The deep contrast between the two viewpoints can be explained by the fact that C.W. Leadbeater - Krishnamurti’s teacher - had failed in discipleship soon after being put on probation in the 1880s. As a result, he was never admitted to HPB’s Esoteric School, as long as she lived. As to the “God issue”, it is no mere question of “personal opinion”. It is linked to a practical matter of decisive importance in occult learning. Belief in an all-powerful God or adoring imaginary Adepts of “unlimited power” is an essential article in the idealized version of discipleship which A. Besant and C.W. Leadbeater created. According to them, individual autonomy is to be entirely left aside “out of devotion”. In this, as in other aspects, they thought very much like Vatican priests. The word “Singh” as used here is a mystical name used by the same Master of the Wisdom who writes the letter. The metaphorical identity between the Mahatma and “lions” comes from the fact that in Sanskrit the word “Singh” means “lion”. From this we may conclude that Eastern Adepts often are physically “greasy” and dirty. Their regular disciples sometimes even refuse to present themselves in clean clothes, as the Mahatma narrates in the same letter. In fact, one of his chelas emphatically refused to deliver a letter to Alfred Sinnett, the reason being that HPB had asked him to present himself with a “cleaner personal appearance”, in order not to offend Mr. Sinnett’s Western prejudices against “dirty people”. The Master explains to Sinnett that the young disciple would not accept acting like the chelas of illegitimate rival sects, which do recommend physical cleanliness (see p. 16 in T.U.P. edition). Discipleship or esoteric learning is an inner process which not only preserves but enhances the learner’s autonomy; and this is quite the opposite of what one can find in “At the Feet of the Master” and other books dating from the Besant period. According to most Adyar authors, the would-be disciple should develop a total and automatic obedience to the supposed Master. This, they say, must be done out of devotion. The idea has been most convenient to the Adyar leaders who wanted to place themselves as “intermediaries” between imaginary Masters and the rest of the movement. Up to the early 1950s, direct “orders” coming from supposed Masters were received through the leaders of the Adyar T.S. and its esoteric school. The system operated until C. Jinarajadasa’s time. Although would-be communications with Masters formally stopped with N. Sri Ram by 1953, power has since then remained concentrated in the hands of the international presidents and “outer heads” of the esoteric school, who, according to custom, are implicitly treated as Popes by the rest of the Adyar Society members, and behave as “occult representatives of the Masters”. The false assumptions present in the above sentences deserve examination. * First, the text supposes that a disciple is able to fully understand his Master’s consciousness and thoughts. This point of view denies the fact that there is a vast difference, in mental horizons and in karma, between an Adept and his poor, ignorant disciple. * Second, the text supposes that a disciple should mimic his Master trying to imitate his thoughts, his words and actions. In reality, since master and disciple are two different beings who have widely different amounts of wisdom, they must inevitably think, speak and act in different ways, if they are true to themselves. * The false disciple totally renounces thinking for himself, or being responsible for his own life and actions. He hides behind that which he fancies to be his Master’s thoughts. Of course, in order to make “discipleship” easier, such “thoughts from the Masters” will be implicitly or explicitly “transmitted” to him by the popish Adyar authorities. It is enough for him to “believe”. Things are much deeper than that in esoteric philosophy, and more democratic, too. Students can’t compare their individual thoughts to the individual thoughts of any Adept. On the other hand, they can compare their views about discipleship to the general teachings of the Masters on the same subject, as they are safely recorded in the Mahatma Letters and elsewhere. A conscious individual responsibility before Life and the Law of Karma is the fundamental condition for every student of Theosophy. The same applies to lay disciples and aspirants to lay discipleship. Although the 20th century messianic attempt made by Adyar leaders clearly failed, its false notions still intoxicate minds and hearts of theosophists worldwide. Similar mayavic ideas influence many who are not situated within the Adyar T.S. itself. These two sentences are quoted in “The Friendly Philosopher”, Robert Crosbie, Theosophy Co., Los Angeles, 1945, p. 389. They are part of a letter from HPB to William Judge, dated August 12, 1887, which had its entire text published at “Theosophical History” magazine, January 1995 edition, pp. 164-165. “The Esoteric Character of the Gospels”, in “The Collected Writings of H.P. Blavatsky”, T.P.H., USA, volume VIII, p. 173. “Is This Theosophy?”, Ernest Wood, London: Rider & Co., 1936, Paternost House, E.C., reprinted by Kessinger Publishing LLC, MT, USA, 318 pp., see p. 163. “Is This Theosophy?”, see p. 162. “Is This Theosophy?”, Ernest Wood, see p. 161. “Krishnamurti and the Wind”, by Jean Overton Fuller, The Theosophical Publishing House, London, 2003, 300 pp., see p. 23. “At the Feet of the Master”, by Alcyone, The Theosophical Publishing House, Wheaton, IL, USA, Pocketbook edition, 1984, 32 pp. See page 9. “The Mahatma Letters to A. P. Sinnett”, T.U.P., Pasadena, CA, USA, 1992, 494 pp., see Letter X, p. 52. The quotation is in the opening lines of the letter. In the Chronological Edition of the “Mahatma Letters” (T.P.H. Philippines), it corresponds to Letter 88. “Letters From the Masters of the Wisdom”, 1870-1900, First Series, transcribed by C. Jinarajadasa, T.P.H., Adyar, Madras (Chennai), India, 1973, see Letter 43, p. 95. “The Mahatma Letters to A. P. Sinnett”, T.U.P., Letter CXXXIV, p. 462. In the Chronological edition, Philippines, Letter 30, p. 95. Living once more in London after several years in Asia, instead of having access to HPB’s Esoteric School, Leadbeater joined the “Inner Group” of Mr. Alfred P. Sinnett, as Sinnett writes in his “Autobiography” (Theosophical History Center, London, 1986, 65 pp.). It was in that group that Leadbeater developed his lower siddhis, during mesmeric and mediumistic sessions in which they talked to false Adepts. By that time, Sinnett’s group was already inimical to HPB’s work. In 1894, three years after HPB’s death, Annie Besant joined that group of deluded people. Coincidence or not, in that same year Besant started her persecution against William Q. Judge, who was loyal to HPB. “At the Feet of the Master”, pages 9-10. “The Mahatma Letters”, T.U.P., see Letter IV, p. 15. In the Chronological Edition (Philippines T.P.H. ), Letter 5. Same Letter IV, p. 16. “Totem and Taboo - Resemblances Between the Psychic Lives of Savages and Neurotics”, by Sigmund Freud, Dover Thrift Editions, Dover Publications, Inc., Mineola, New York, USA, 1998, 138 pp., see p. 25. “At the Feet of the Master”, pp. 13-14. “The Mahatma Letters to A.P. Sinnett”, T.U.P., Letter LXXII, p. 374. In the Chronological Edition (T.P.H. Philippines), this is the Letter 95, p. 333. “Letters From the Masters of the Wisdom”, transcribed by C. Jinarajadasa, T.P.H., Adyar, India, second edition, 1973, see Letter 72, p. 129. “Isis Unveiled”, H.P. Blavatsky, Theosophy Company, Los Angeles, vol. I, p. X. An initial version of the above Chapter was published as an article at “Fohat” magazine, Canada, Fall 2007 edition, pages 64-68.